Solid earcup without hinge as well as additional mesh earcup option. 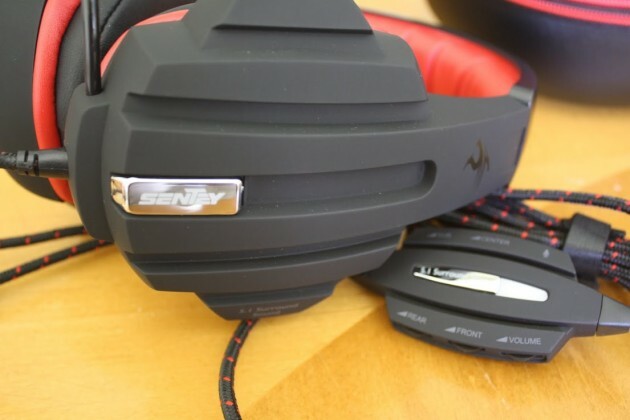 Sentey has been around since 2005, but isn’t necessarily a ‘household name’ in tech circles, at least in the North American market. However, we took a look at the Sentey Burton case in 2011 and found it to be pretty damned good. With that in mind, now we’re digging in to the Harmoniq Pro, a true 5.1 surround headset. 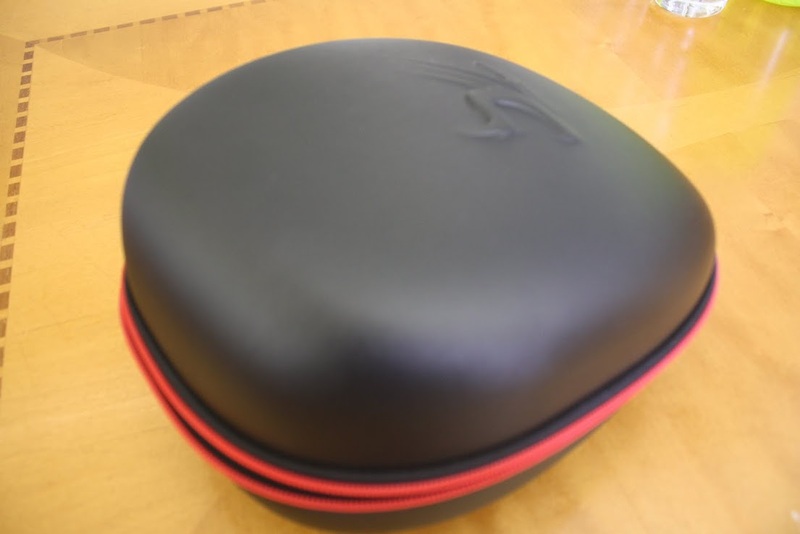 The headset arrived in a zippered travel hard(ish) shell case inside a foam lined box. The shell has a molded feel to it and keeps its shape when left alone, but is certainly not crush-proof. It appears to be standard with all Sentey audio options. Inside the pouch is a mesh pocket that contains two alternate mesh earcups. The headset arrived with a soft leatherette option installed, but you have the choice of using the firmer mesh earcup at your leisure. An elastic band keeps the headset securely in place. Standard case to keep your investment safe. The headset itself is a sleek matte plastic in black with red LED accents on the outside of both earcups and terminal end of the microphone. The headband is lined with a soft leatherette material and forgiving foam pad. A fabric braided cable is permanently connected to the left earcup—I have little fear of wear and tear taking its toll on the joint, though. About three feet down the cable is an in-line control panel, offering adjustments to all 5.1 channels and mic (but no clip for your clothing.) A small boom microphone is permanently attached to the left side of the headset. It does not retract, but is more than flexible enough to fold upward and out of your line of sight should you wish. The earcups are held in place by a plastic diaphragm that clips into the headset, which allow you to swap out soft leatherette cups for mesh covered ones. Underneath the pads rest a 30mm front and rear speaker, a 40mm center speaker, and a 27mm subwoofer. Elastic band to keep things secure and pocket for earcups or general storage. Rounding out the rest of the extras, Sentey has included a driver CD, poster, stickers and a funny little door sign with the options “NOT NOW I’M GAMING” and “It’s safe” for you to proudly display. Sentey also includes a VIP benefit card for registration, as well—though at the moment it doesn’t appear to offer you anything other than a mailing list signup. Sentey’s really put some time into the product manual booklet. I realize this is entirely ancillary to the product itself, but it’s a very nice touch that hasn’t gone unnoticed. Often times you’re left with a large unfolding pamphlet that has 300 languages and is size 3 font. Sentey has clearly labeled (color) pictures and graphics within—little things like this can certainly add to the user experience after the purchase. The included software is nothing to write home about, but offers plenty of adjustable options for your own experience and setup: input/output selections, DSP modes, equalizer choices, environment effects and even a karaoke (read: voice changing) option. You’ll find this same software suite offered by many of the market’s cheaper 5.1 offerings. Fit-wise, the Harmoniq Pro is very comfortable. The leatherette earcups are so soft and forgiving that you’ll hardly notice you’re wearing a headset at all. As an added benefit, the seal they provide creates a natural sound isolation during use. The set is very lightweight—heavy use did not cause any pressure points after extended wear. As with the Crossfade LPs that we reviewed, you’ll find yourself taking a ‘cool-off’ break every so often as heat tends to get trapped. That being said, if you would rather use the mesh option for longer gaming sessions—the heat issue is non-existent, but so is your noise isolation. I found that the mesh earcups actually created a pressure point around my ears after extended wear, which made me go right back to the leatherette option. Swapping out the pads is simple enough—a plastic diaphragm pops out, allowing you to wrap the pad before reattaching them to the headset. The only downside in terms of fit and use comes in the form of those LEDs that were added for flair. Your peripheral vision is capable of picking up the light in a dark room if you’re looking left or right of your “center point.” Thankfully, the LEDs have the same matte styling as the rest of the headset, which mutes the glare. I found it to be a non issue. Explosions galore! Bring on the bass! The Harmoniq Pros provide a nice punchy bass sound to whatever you happen to be playing. Titanfall and Battlefield’s explosions and combat sounded phenomenal. NBA 2K14’s court noises and crowd cheers were very realistic. While you won’t be buying these to sit with brandy while appreciating your audio library, they handle a wide range of music genres well. Movie audio was muddied during quiet scenes in particular, but otherwise worked just fine. 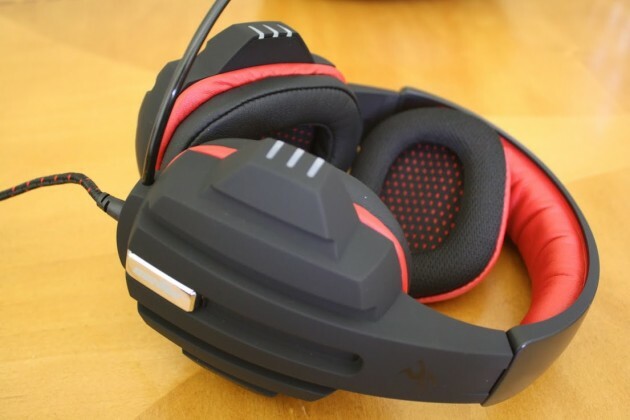 The true 5.1 is handled well by the headset’s 30mm front and rear, 40mm center and 27mm subwoofer channels and really shines in gaming. Voice communication over Skype/Mumble can sound a bit hollow at times. 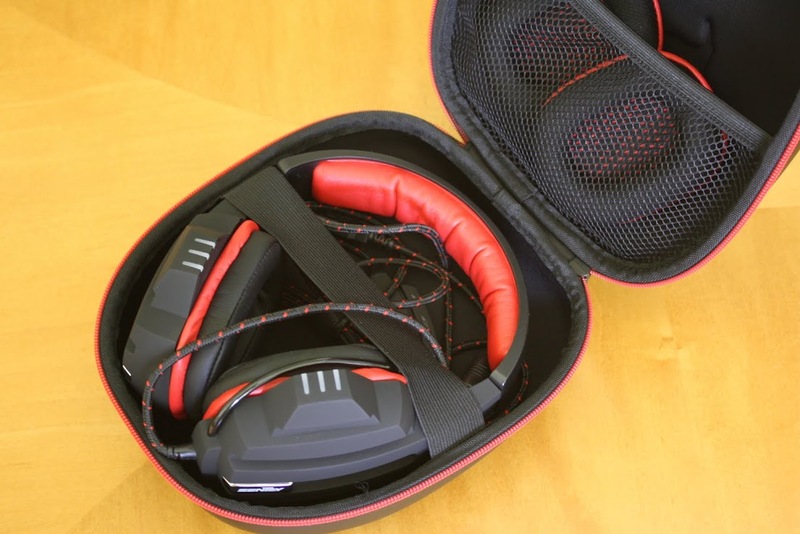 Lightweight styling and comfortable padding provide hours of gaming with great sound. While I would have liked to have seen a non-fixed earcup, the solid build quality and snug fit certainly make up for it. Sentey has slashed the price on the model down to $69 on Amazon. This is a great price point for a true 5.1 headset that has included extras like travel case and optional earcups in the package. Really, it’s a steal at that price, especially when compared to Logitech and Razer offerings. Certainly a recommended buy for both the LAN traveler and battlestation gamer at home. Great job on the review. I would buy this headset based on this read.